Infiltrator Deathmatch, The (PC) Review - Game Reviews | Squackle.com! The Funniest Site on the Net! 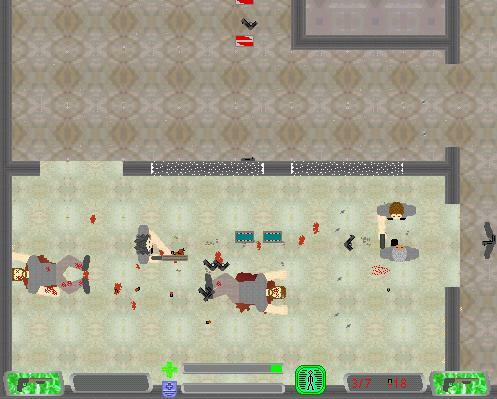 This game is all about shooting different types of weapons, and killing other AI players in the same map. 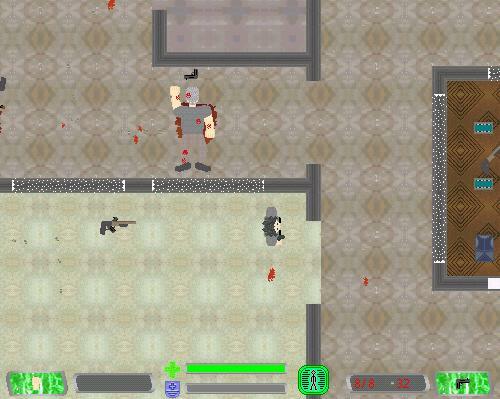 The graphics have nothing especially special, but the sprites are made very well. I couldn’t seem to get any music to work, though it said there was some. The gameplay is awesome once you figure out what you do to control your guy. The only bad thing about it is that it took me a while to figure out how to shoot the guns, drop a weapon to pick up another one. I couldn’t find anywhere that explained it, but I might have missed it. How you die a lot =(. There is no crappy part about this game, except maybe the top down aspect of it, but I can’t see this game played any other way. This game is one of the best I’ve ever played, made with Game Maker, and I recommend that anyone that isn’t politically correct and against violent games download this game. There are 3 modes of gameplay, 5 maps, and 5 unique weapons. Its fun, and keeps you entertained for many half an hours to come.